Relevant work by Loren Boreal/6502 Group Blaney who sent a x86 256-byte version of the latest 2014 sliding block puzzle video game called 2048. Also make sure to browse his work on his homepage as it is full of history and wicked programs. Source and binaries made available in Assembly art section. Published a 256 bytes intro presented at Riverwash demoparty in Katowice Poland where it placed first.It is inspired by 1997 same-name movie. Source and binaries made available in Assembly art section. Relevant work by Vlad Romascanu with a fast sound emulator notably capable of emulating dma transfers nowadays forbidden in Virtual 8086 mode starting with XP+. This means it is easy to run a module player (as 1kbmod below) without any need from such as DOSBox or minifmod. After installationn, simply start a cmd, execute DOSDRV.EXE and then just type the name of the executable with module player. You may download it here. Published a 256 bytes intro presented at Chaos Constructions demoparty in Saint-Petersburg Russia where it placed second.It is an attempt at a realtime remake of a well-known precalculated effect from the demo Enigma of Amiga demogroup Phenomena. Source and binaries made available in Assembly art section. Relevant work by Leecher1337/Dose this week publishing a ported NT4's Insignia Solutions' SoftPC 32-bit protected mode NTVDM emulation to Windows10 enabled by previous NT4 source code leak, OpenNT forum and Stephanos' combined efforts. NTVDMX64 enables running 16-bit DOS code on an AMD64 architecture x64 Long compatibility mode WoW64. Initially reserved for VAX VMS, DEC Alpha and the Mips architectures, Microsoft's compilation would default to Virtual 8086 mode for X86 - once the sourcecode was made available to the public Leecher1337/Dose was able to force the SoftPC 32-bit emulation even for X86 thus making it de facto runnable for X64's compatibility mode, notably on Windows 10. Read more mitigations here. You may find a fresh compiled NTVDM for x64 here. Use at your own risk for it requires a WoW64 "on-the-fly" code injection known as Heaven's Gate. Published a 1kb wedding intro for DOS in honor of one of my dear friends. The code for the binarywas hurried and will thus probably not be published. Published a 256 bytes intro inspired loosely by Zaxxon arcade classic. It placed first in the HiEnd 256b Intro category at DiHalt 2016 demoparty in Nizhny Novgorod in Russia. Greets to its welcoming organizers and participants as well as very warm thanks to Fra/Mandarine^RSE currently in Kyoto for video capturing intro on such short notice. Source and binaries made available in Assembly art section. Published a 256 bytes intro ungainly inspired by darkroom 40k for Amiga. It was supposed to be presented at QBParty 2016 in Sulysap Hungary but was accidently erased in a HDD crash and thus released out-of-band. 25% of the code was blatantly copied from Fabian 'Ryg/Farbrauch' Giesen's circle implementation (was unable to make it smaller while maintaining same precision in texture mapping). Source and binaries made available in Assembly art section. Published a 128 bytes intro demonstrating raymarching representing Battle of Hoth scene with 3D textured AT-AT Walkers and accompanying flying spaceships. The intro won the combined 128-byte competition at Outline demoparty in Willemsoord Netherlands. Source and binaries made available in Assembly art section. Published a 128 bytes intro demonstrating raymarching and fake wireframe volume texturing with path script portraying 3D Moai statues such as in Arkanoid : Revenge of Doh. The intro came in 2nd place in the combined 128-byte competition at Outline demoparty in Willemsoord Netherlands. Source and binaries made available in Assembly art section. Published a 128 bytes intro demonstrating use of small MIDI music tracker. It plays a 6-pattern long module inspired by Like a G6 by Far East Movement on 3 simultaneous channels. The intro placed 3rd in the combined 128-byte competition at Outline demoparty in Willemsoord Netherlands. Source and binaries made available in Assembly art section. Published a new 256 bytes chess program for Phrack Magazine issue #69 (Volume 0x0f, Issue 0x45, Phile #0x04 of 0x10). One can find the article in online Linenoise section. Source and binaries made available in Assembly art section. Published a 64 bytes MIDI music tracker to help a computer teacher Dmitry in Pouet BBS related thread. Source and binaries made available in Assembly art section. Published a new 256 bytes chess program for 2600 Magazine "The Hacker Quarterly" - one may buy the Spring 2016 paper issue through the latter's website or Amazon.Source and binaries made available in Assembly art section. Jim "Trixter/Hornet" Leonard published an interesting 145 bytes Natural language processing experiment in computational poetry called Nickbait (Nick Monfort is a renowned digital poetics pioneer). Source and binaries made available in Assembly art section. Published a 256 bytes intro called Futura with ray marched city, MIDI sound and an environment mapped 3D cube presented at SynchroNY 2016 demoparty in New York City/USA, winning the new 'nano' category. Source and binaries made available in Assembly art section. 2015 was a good year again : 8 entries made the Pouet Top Lists 2015, notably Top 50 productions in 2015 (#8.BootChess, #11.Megapole and #45.Centurio), Top 10 128b in 2015 (#1.Deus faber and #2.Sun road), Top 10 256b in 2015 (#1.Megapole and #4.Centurio) and Top 10 Games in 2015 (#1.BootChess). The updated sourcecode Pouet Top List Generator used and originally created by Luis Gonzales was uploaded. Also added the Amiga Os 3.1 sourcecode released recently courtesy of Hacker Fantastic to the OS sourcecode archive of the Assembly sourcecode section. Updated also the 1492-byte 1ksbmod (ScreamTracker 3 compatible Amiga .mod music player binary footprint for DOSBox 0.74) with a reduced 1427-byte version from Peter "Qkumba" Ferrie. Updated also the 44-byte Conway's game of life cellular automaton version to 42 bytes. Added bootc64.txt in Assembly art section courtesy of Ninja/The Dreams (check out his amazing c64 reference website). Lastly, in these times where Linux GRUB has proven to be insecure ("You Can Break Into a Linux System by Pressing Backspace 28 Times"), may I suggest you use the built-in BIOS password feature along with 336-byte biosscan2.asm secure boot instead. 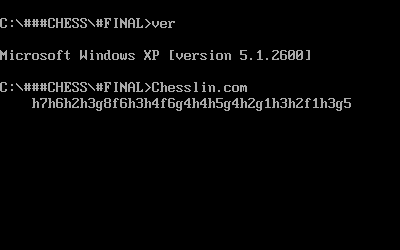 New record for the smallest chess program on the planet : 455 bytes. Source and binaries made available in Assembly art section. Relevant z80 programming by Pater "Utz/Irrlicht project" Maria of music tracker named Houston Tracker version 2 for TI-8x calculators. Source and binaries made available in Assembly art section. Freelance journalist Chris Stokel-Walker reports on new 30-year record BootChess' making and analyse its motivations for this week's The Kernel's "The Obsessions Issue" on behalf of The Daily Dot in an article entitled The bitter rivalry behind the world’s smallest chess program : "An obsession is the thing you can’t escape, the thing that reveals more about you than you’d care to know." Published a 256 bytes intro inspired by Fritz's Lang iconic Metropolis Babel tower scene and presented at Function 15 demoparty in Budapest Hungary [EDIT : placing second]. Source and binaries made available in Assembly art section. Added a new section featuring all paper and online press coverage including some interviews. Published a 256 bytes intro presented at Riverwash 7 demoparty in Cracow Poland where it placed first.Source and binaries made available in Assembly art section. Published a 256 bytes intro presented at Chaos Constructions demoparty in Saint-Petersburg Russia where it placed first.It is an attempt at a generic early classic demo with a 3D checker board textured plane, a parallax starfield, a group logo, raster bar gradient sky over moutain ridges with 3d shaded cubes spinning and scrolling on top. Source and binaries made available in Assembly art section. Tony Haines and Eli-Jean "Pervect/Topix" Leyssens have published a 1180 bytes ARM processor RISC OS code compressor entitled CodePressor aka Pretty good ARM code compressor. Source and binaries made available in Assembly art section. Antonio Villena and Einar Saukas have published a 64-byte Zilog Z80 ZX Spectrum 48k optimal LZ77 LZSS entitled ZX7 Mini Compresor. Antonio also included an unofficial 59-byte stub version limiting look-ahead to 255 bytes. Sources made available in Assembly art section. Peter "Qkumba" Ferrie published a Brainfuck interpreter in 159 bytes for Apple II's Mos Technology 6502. Source made available in Assembly art section. Robert "Orbitaldecay" Forder published a self-hosting x86 assembler in 506 bytes inspired by Frank A. Vorstenbosch's cross-assembler work asm96. Source and binaries made available in Assembly art section. Peter "Qkumba" Ferrie reduced the unreal mode 42-byte tiny4gb snippet to only 34 bytes while not assuming zeroed memory and allowing for floppy launch. Source made available in Assembly art section. Published a x86 2048-byte BASIC language interpreter for young girls aged 5 to 10 to entice the latter to program. Also published bare 1771-byte record binary footprint version for Tiny BASIC (the previous smallest Tiny BASIC record was held since May 1976 by by Erik T. Mueller with 1.75kb (1792 bytes) on MITS Altair 8800 for intel 8080. All was only feasible because of important prior works by, notably but not only, repectively : Mr. Li-Chen Wang, Mr. Denis Allison, Mr. Michael Sullivan and Mr. Frank Kotler [EDIT : a generic blue genderless version with stripped text was added to archive after requests EDIT2 : fixed wrongful IF clause interpretation in Girlbasic2k.asm and Girlbasic2k_blue.asm (was working correctly already in Basic1771b)]. Source and binaries made available in Assembly art section. Thanks to Terry/LinuxChix for "supporting women in computing." Published 44-byte Conway's game of life cellular automaton from original already optimized version by Vladislav Kaipetsky, Tenie Remmel and Mark Andreas. Source and binaries made available in Assembly art section [EDIT : reduced to 42 bytes]. Published 48-byte PCX viewer based on reverse-engineering Arminio "GrGa/m&g" Grgic's 56 byte PCX viewer [EDIT : Peter "Qkumba" Ferrie bettered it to 47 bytes only]. Also updated bug-fix for 1ksbmod and reduced its footprint to 1463 bytes. Source and binaries including examples made available in Assembly art section. Published three small intros. Deus faber a 3D Sierpinski fractal landscape won the Outline 2015 demoparty combined 128 bytes intro category in Willemsoord The Netherlands while Sun road raymarching Minecraft-like placed second. Pacman256 is a playable Pac-Man game and placed 2nd at the QB party 2015 in Sülysáp Hungary in the 256 bytes combined category. Source and binaries made available in Assembly art section. Published the odd/even address disassembly of the DOS .com's Program Segment Prefix (PSP) now available in Assembly art section. I also wish to thank BBC News and Mashable for their respective interviews about the world's smallest computer chess program Bootchess (and yes ! Garry Kasparov, my challenge still holds...), ITworld for comparing me to the likes of Donald Knuth or Richard Stallman in their article entitled "9 of the most impressive solo programming efforts" and Sam Dyer (author of Commodore Amiga: a visual Commpendium book) for his book interview on my 30th year anniversary in the demoscene and for sending me his superb Amiga book. Abductee was nominated and received a honorable mention at the Meteoriks demoscene award broadcasted (cf. video link) live from Revision 2015 demoparty in Saarland/Germany [EDIT : received 2015 Tiny Intro Nominee certificate]. Published a 256 bytes intro presented at 7DX 2015 demoparty "The Last Party" in Istanbul Turkey where it placed first.It is a checker textured lighsourced 3D environment with MIDI drumbeat inspired by the early coin-op Zaxxon. Source and binaries made available in Assembly art section. Published a 1492-byte ScreamTracker 3 compatible Amiga .mod music player binary footprint for DOSBox 0.74 (n.b: vibrato was stripped but can easily be put back), following Jim "Trixter" Leonard's request. Source and binaries made available in Assembly art section. [EDIT : added a full features 1736 bytes version (with vibrato) in download archive EDIT2 : corrected bug silencing 3rd and 4th channels, increased mixing frequency to 11Khz and reduced footprint to 1463 bytes in updated archive]. Next post will allude to breaking David Horne's 1K ZX Chess 33-year-old record as smallest computer playable chess game. Big thanks to Peter "Qkumba" Ferrie for accepting to peer-review the latter code prior to publishing. 2014 was a good year : 8 entries made it to the Pouet Top Lists 2014 : Orbit was awarded #1 of 2014 Top 10 64b category, Floorcast64 was awarded #4 of 2014 Top 10 64b category, Wolf128 was awarded #1 of 2014 Top 10 128b category and #10 of 2014 combined Top 50 productions, Mayan was awarded #2 of 2014 Top 10 128b category, Abductee was awarded #2 of 2014 Top 256b category, Helicave was awarded #3 of 2014 Top 256b category and #4 of 2014 Top 10 Games. Mayan won the 128b Outline 2014 demoparty competition in the Netherlands where Wolf128 also placed second, Abductee won the 256b Function 2014 demoparty in Hungary and Paname placed third in combined 1k demoJS 2014 demoparty in France. All of the corresponding sourcodes were published previously here. Added DOS v1.25 sourcecode to OS sourcecode in Assembly sourcecode section (courtesy of Tim Patterson). Added 20-byte C64 6510 version of 10print.asm (courtesy of Steve Koch). Published a 1 kilobyte intro presented at DemoJS demoparty in Paris France. It is a 3D box scene with 3D Lissajous curve campath, synchronized music, raster monochrome bitmap and credit titles.It placed 3rd in the combined 1 kilobyte competition (first place of non-accelerated entries). It was rushed in 3 days therefore prettyprinting the sourcecode will follow in Assembly art section shortly. Published a 256 bytes intro presented at Function demoparty in Budapest Hungary. It is a lighsourced textured multi-level maze with 3D Lissajous curve campath and atmospheric sound.It placed 1st in the combined 256 byte competition. Source and binaries made available in Assembly art section. [EDIT : abductee was featured in the Highlights of Function 2014 demoscene meeting video wrap up]. Published register startup values of all various DOS systems from Ben "fys" Lunt and Ange "corkami" Albertini. Made available in Assembly art section. Published two 128 bytes intros presented at Outline demoparty in the Netherlands. Mayan is a raycast scene flyby with music that won the combined 128 bytes intro competition - Wolf128 is a mouse controlled Wolfenstein 3D and placed 2nd in the same competition [EDIT : finalpatch ported Wolf128 to GLSL in Dissecting the 128-byte raycaster blog entry and Kasper "Poizan42" Fabæch Brandt ported Wolf128 to SML on GitHub. Source and binaries made available in Assembly art section. Relevant work update from several people added to Assembly art section. Added a 5kb .PNG decoder for AtariST by David "GT Turbo^CVSD" Brylka. Added a 256-byte Mona Lisa rendering program for AtariXL demonstrating implicit compression or Genetic Programming (GP) applied to procedural graphics by Jakub "Ilmenit" Debski. Added a 30-byte LZSS decompression stub for AtariST by Francois "Zerkman^Sector1" Galea. Added a 14 byte paint program paint14b modified by Suborg from original version by HellMood. Realized late Peter "Qkumba" Ferrie did the same thing on the same date with HeliFix a DOSBox patch whilst notifying me a technical list of bugs. Thank you for the quality feedback. Updated helicave release with a safe version for DOSBox. Published a 256 bytes Super Cobra game clone named helicave featuring pixel graphics, parallax scrolling, 9 levels and player score count, i/o management, sound effect, animated sprite, procedural graphic bezel/scoreboard and dynamic terrain and textures generation. A YouTube video of the gameplay is available here. Source and binaries made available in Assembly art section. Posted preview of an upcoming 256-byte helicopter game. Orbit received surprisingly good reviews on Pouët.net, Dark Bit Factory, YouTube, Hacker News, Diaspora, Facebook and Tawqer. Thanks to Peter Hellberg for porting Orbit to Mac OS X's Boxer. 09/02/2014 lmc1992 Added Atari Microwired LMC199 optimized stable routines by Arnaud "gwEn" Carré published in aLiVe! diskmag in Assembly Art section. 09/02/2014 atariregs Added Atari ST/STe/MSTe/TT/F030 hardware register listing by Dan "goemon" Hollis and Denis "STGhost^SectorOne" Huguet in Assembly Art section. Big update. Added ACME cross-assembler for 65xxx by Marco Baye to Assembly ressources section. Added realdosxp.bat : a simple answer to The Windows command prompt is *NOT* a DOS prompt! and enter Win98 "real" DOS shell in WinXP ntvdm in Assembly art section - useful for example if you wish to access non-polluted DTA in PSP for modern COM files. Added a nasm MBR POC entering x86 Long mode (64 bit) directly from real mode (16 bit) without entering protected mode (32 bit) by Brendan "Oculusfervoris" Trotter in Assembly art section. Added several impressive 65k and x86 sizeprods of Peter "Qkumba" Ferrie in Assembly art section : rts.asm, pehdr32.asm, pehdr64.asm, brainfck.asm, isx64.asm, juliambr.asm, 10hprint.asm, 10print.asm, aplibunp.asm, lz4unp.asm and lz4unp02.asm. Relevant work for a 79 bytes footprint lz4 x86 decompression stub by Jim Leonard aka Trixter modified by Peter Ferrie aka Qkumba. Wrapper tools and stub in Assembly art section. Interesting 68k code gems for bit manipulation and patterns generation from Alain Brobecker aka baah/Arm's Tech and others added to Assembly art section. Published a 64 bytes intro named orbit using volumetric raymarching. Source and binaries made available in Assembly art section. The archive now contains an updated Orbit2.asm version after Jan Kadlec aka Rrrola hinted at two optimizations on the corresponding Pouet thread. Video link : here. Published a 9 bytes parabola and a 19 bytes modified 3rd order Taylor sine approximations. Source and binaries made available in Assembly art section. Added YouTube links to phone video captures of tiny intros using here. Source and binaries made available in Assembly art section. Published a 128 bytes intro named nightshift using raymarching. Source and binaries made available in Assembly art section. Published a 256 bytes intro named darnit! using raymarching and midi sound. Source and binaries made available in Assembly art section. Taipei based taiwanese company Jetway Info ltd. published this past week the AMI Aptio UEFI BIOS ("a successor to AMIBIOS8 based on the UEFI standard") source code on a public ftp. The sourcecode may be downloaded via the Assembly sourcecode tab above in the BIOS sourecode section. Published a 366 bytes upgrade of the biosscan secure boot Master Boot Record (MBR) protecting against modifications of vme, cpu, rom, nvr, mbr, chs, ivt, rst and kvm on all x86 architectures macosx, windows8, windows7, windows xp, windows vista, windows7, ubuntu and linux. Modified the layout of the page to suit its future needs. Added use of thumbnails and mirrored all code size competitions. Some files still cannot be uploaded because of their respective sizes. Published amaze 2 a second version of amaze following feedback trading-off texturing whilst adding 1)divide overflow test 2)double-buffering preventing flickering/tearing 3)speed and 4)better viewpoint yaw angle precision. Published a 128 bytes intro named amaze as a Wolfenstein 3D clone inspired by Justin Frankel's Nullsoft 256 bytes intro labelled gaycast. Published a 919 bytes bin/.com packer with sourcecode using an old Apple II text compression static scheme (the 16 most frequent bytes are encoded on 5 bits and the rest on 9 bits). Preliminary benchmark tests on small files such as zud by pyrodex yield encouraging results where bytepack>ssnpack>apack>lz77>lzss but it is apparent one cannot compress a sector's worth of binary code without tayloring it by hand (the benchmark tests are included in the archive). The included decompression header stub is unfinished as an alpha release. Published a 128 bytes intro named apathy using raycasting and midi sound inspired by Frag's work. Published a 86 bytes floorcast intro based on a 114-byte version named VGA floor Casting by rain_storm of dbz. Published a 115 bytes speech synthetiser based on Microsoft's Speech Application Programming Interface (SAPI) and tested on "out of the box" XP SP3. Published PicoAsm, a 4735 bytes x-86 32-bit assembler. Supports all 80386+ mnemonics/opcodes, assembles itself, and assembles faster than Borland's TASM or Microsoft's MASM. The documentation for PicoAsm was originally written by Dr. Carl Burch. I am not yet releasing the sourcecode, because I still have to convert the syntax it to be 100% NASM compliant, and because I might eventually submit it to a demoparty, and hence wish to prevent the entry's automatic disqualification for doing so beforehand. Ultimatly, my wish is to converge most opcodes as a RISC architecture for native size-reduced binary code. Usage is as NASM : 5kpasm32.com filename.asm -o filename.com. Relevant work by Keith Henrickson, and Dan Boris, reverse-engineering the Atari 7800 BIOS. In the BIOS sourcecode section. Relevant work by Maxim, Dan Weiss aka Dwedit, Michael Thornbury aka Kuwanger, Franck Charlet aka hitchhikr/Neural, and lastly Jorgen Ibsen/Ibsen Software for their tiny aPLib decompression stubs respectively for x-86(186 bytes), Z80(233 bytes) and 68x0(164 bytes). Relevant work by Brian Raiter aka Gorlak/Muppetlabs with a tiny 53 bytes Linux ELF executable header. Published a 611 bytes bin/.com packer with sourcecode using Static Semi-Nibble compression scheme. It was inspired by BlueOwl's Nibble Compression Engine as published in DCA#1 magazine. The decompression header stub is 69 bytes. Relevant work by Franck Charlet aka hitchhikr/Neural for his ingenious Win32 212 bytes code (including PE header) compression framework stub using the embedded zlib PNG library in DirectX d3dx9_30.dll. Depacks a pre-modified 7-Zip compressed stream on Windows 2000, XP, Vista and Seven. Relevant work by RiXtA/3SC for the Demobit 2000 demoparty, with his Intel 8086 256 bytes self-disassembler aka quine in computing. As a bonus, also includes Rob Clark's similar tautology for the ARM architecture. Published a 42 bytes Big/UnReal Mode snippet. It builds its GDT dynamically (tested with bochs). Published a 19 bytes Power On Reset Vector snippet. Re-entering POST through PORV before BIOS int 19h MBR bootstrap (tested with bochs). Relevant work by Apokrif on the MDL forum while seeking to mod Dell's Phoenix BIOS, producing unassembly of the latter's 77-byte LZ77/LZSS implementation. Also includes a 68x0 32-byte version for an Atari ST bootsector by Alain Brobecker aka baah/Arm's Tech as published in this pouet thread. Relevant work by Tapani Utriainen aka Nadir/RAGE displaying an attached UHCI USB device's descriptor in 233 bytes for Hugi Magazine's size coding competition #28. Uses tasm. Published a 343 bytes BIOS integrity checker MBR using a 64-bit LSFR.It has a graphic text 100x75 character ala DEBUG visual interface and some anti-debugging.Since most BIOS rootkits either modify the uncompressed LZSS entrypoint, or point to some virtual bios rom extension, CRCing the top of the IVT to the bottom of the F segment in shadow RAM, seems rather simple yet quite elegant.You will need nasm, bochs vfd and partcopy (or dd) to test it. Relevant work by Max Reitz aka XanClic for OSDev board's 4th 512-byte competition : sending/receiving ARP protocol packets in order to resolve a MAC address within the MBR. Needs QEMU because only works with RTL8139 family network cards. Nevertheless hats off to him ! Almost there (less than 500 bytes to go). Converted source from tasm to nasm. Can be rebuilt as elf binary too since no more dos calls left. Published a 3kb (4089 bytes reduced to 2983 bytes) version of playable pacman3k with sourcecode under GNU licensing. If one strips out the score prints int 21h calls, it is 100% BIOS. The sourcecode contains the embedded DOSBOX DOSBOX-0.73.CONF file.Using the latter, pacman3k runs under Windows, Gentoo Linux, Mac OS X, Solaris 10- sparc, FreeBSD, Fedora Core, OS/2, BeOS, Risc OS, and of course MS-DOS. Published a 2kb footprint soundblaster asynchronous music Amiga MOD module player framework for the PC (published originally for the defunct Orange Juice site). The include file musicmod.mod composed by Franck Boularouah (thanks to him!) was directly inserted in order to stick to the single file paradigm, so it's a little bulky. Nowadays, nobody uses DOS SET BLASTER= envar anymore, and call the windows waveOut API to play audio, but most of the tracker code remains valid. Published a beta of the 6k irc botnet framework for win2k/xp with ICMP4 flood ddos payload.It's not advanced or anything fancy, just a little POC. The goal was to have the basic functionnality of the blackboard concept (pool of information), without any additional software than what is installed by default on 2K/XPSP2. On XPSP3, Vista, and Windows7, it will surely trigger the UAC. I will do another version with on-the-fly SSL certificate generation for the IRC connection. Also, a friend of mine hinted in return netcat nc.exe could be replaced with polling the builtin "netstat -a" command. Bot hardening can be tested by modifying the ipv4 address to be hosted some free Dynamic DNS host. Re-released pacman4k sourcecode originally published in Claus Volko's Hugi diskmag issue #20 and released at The Assembly demo party in 2000. The marquee itself takes 2kb alone and the only 2 dos calls that could be stripped are for scorekeeping and credits. Plan to reduce it to maybe 1kb bios. Demonstrates hires graphics using unreal/woodoo/big real mode, recursive compression, RTC frequency TTL speaker sound based on ROM fonts modulation. Quite popular download on programmersheaven.com site (5825 hits) and scene.org site (1239 hits). Assembly language and its promotion. Aware of other worthy assembler code ? Thanks to Matthew Taylor for his 3 Column (Holy Grail) Liquid Layout and William Bontrager for his Web Page Library, both used on this page.